The packs are on their way! Following a few issues with our printer ( the guys who print & send out the packs) , we’re back on track with the packs. What will I get in my pack? 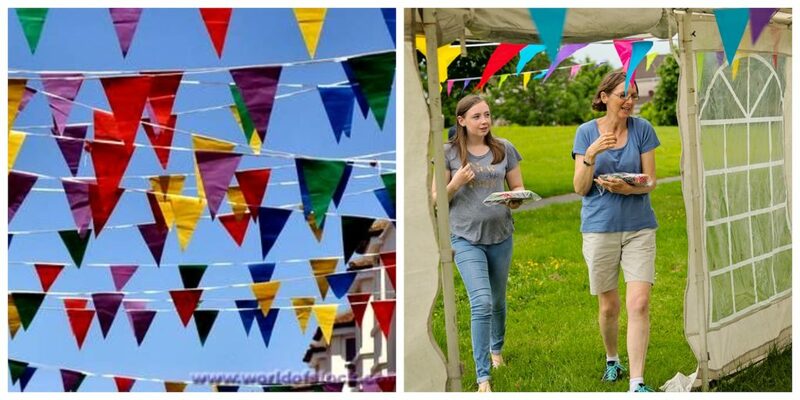 You’ll get 20m of multicoloured bunting and 10m of paper garlands to hang from trees, lamp posts, shrubbery.. anywhere at all! Get creative- we’d love to see how you’ve brightened up your street. We’ve included a bunch of fancy lookin’ invites to help you get the neighbours on board. Start knockin’ on doors, posting them through postboxes and creating a buzz. We’re pretty proud of this year’s neat looking Street Feast posters. You’ll get one in your pack which you can fill out and stick up wherever you please. There’s a really handy how-to guide included in this year’s packs too which we’ve no doubt will answer all your feast queries.